I have learned so much about myself, about others, and about technology! 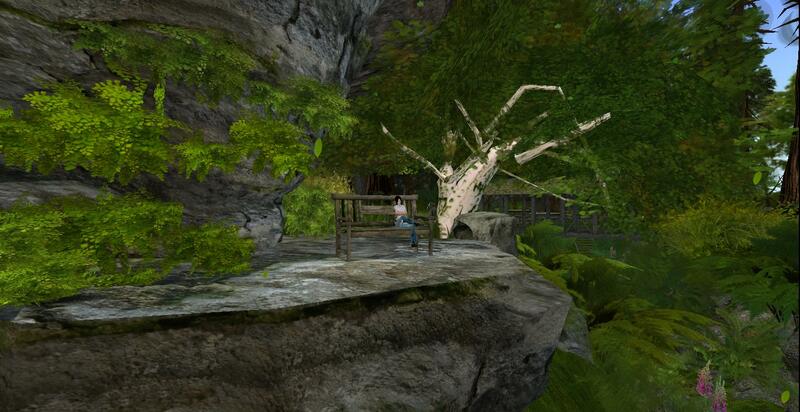 It was interesting to explore a new world (SL) with classmates and the next time I think our world is small I will remember the people on Virtual Ability Island who use SL to meet others from around. Although I feel SL is not for me it is neat to see an avenue for those that need it. I have made a few new friends and discovered that Dr. Turner has more patience than anyone I have met! Hopefully I will take what I learned and apply it to the beginning of the next group project I have. Communication is often seen as cut and dry. You communicate and ideas are relayed back and forth and perhaps something is obtained, exchanged, or learned or all of the above. As we learned in class, a post is a communication and is usually intended to provoke a response. Communicating over time zones is difficult but not impossible. I think SL was great for this purpose because we could talk without being charged! Communicating via social media can be difficult and I would like to explore this further. Social media is designed to satisfy our instant gratification lifestyle. If we are too busy to call and write, are we too busy to effectively communicate, more than just a “like” or “wow, that’s neato,” or “don’t eat here”? People who use social media have said it’s nice for them in their busy lifestyles. It is nice to see photos of people because a photo can say a thousand words. But Brandon Stanton said what made his photos come alive were the words of the people in the photos. A photo alone did not create the stir that is Humans of New York. For those that have said communication is difficult over social media, is it because social media is not designed for full blown conversations? Conversations are necessary for group projects because a conversation is a give and take. Listening is necessary. Reading is great and if everything needed to be said can be said by typing so everyone else can read the whole thought, great. But we write differently than we read and writing an entire thought, with supporting thoughts so the intent is coherent, is time consuming and can get lengthy. In turn, it is then lengthy to read. Students who take their first online class think it will be a breeze until they realize that they have to read everyone’s posts and respond to several. It is a time consuming task. If you sit in a class for one hour a plethora of information can be exchanged and the opportunity is there to split off and talk about other subjects. It is more time consuming to do this when reading and responding. Look at this dress, is it gold or silver or white? Someone political said something stupid. Again. Will they be fired? Need to laugh out loud? I’m having a bad day, anyone else need a drink or a movie? Even our videos were too long so Vines are popular. On one hand it is clever and warms the soul to see such creative ideas. The flipside is that it is not like reading a book with full characters and full plot lines. It is quick, it is over, and you move on to the next vine. We could live without vines. I am not convinced we could live without books. For a group to be coherent, I think conversations need to take place. So perhaps social media is an effective tool for some things but I do not see it as an effective tool for group work in which more than two people need to work together toward a goal. Especially people who are strangers to each other. I also think for a group to be coherent it is beneficial if the group members get to know each other, even if just a little. I am convinced the most effective method is by talking, not by typing less than 20 words every 20 seconds, not by looking at photographs without words, and not by looking at reposts. There is no replacement for a genuine conversation. Two members of my group could not make our weekly meetings and ended up giving a presentation outside of class time. The first thing they did was to meet to discuss their next steps. People have been fired for tweeting their thoughts that should not be spoken aloud or shared. We all have these thoughts; I would like to think mine are funny but taken out of context they may appear rude or worse, offensive. Technology allows us instant access to people and some cannot handle that responsibility. This is one reason I will never have a Twitter account, I am fearful of people knowing my thoughts. Instant access can be good, in the case of the consumer becoming the producer, but it can also be treacherous, in the case of people being fired because they said something they should not have. I do not know a person who has said something they should not have, at least once, at some point in their life. But saying it in front of a few people, or even a crowd, is very different than saying it in front of the world and having it captured in writing forever. I wonder if Twitter has an option to delay a tweet? My dishwasher can delay up to 8 hours, my washer can delay up to 24 hours, and I’ve heard you can delay taping or digitally recording a television show. If Twitter has a delay option, perhaps some jobs could be saved? I think tweeting before thinking is akin to drunk dialing. Maybe we just need better technology to meet the needs of our own stupidity? If cell phones had a breathalyzer they could prohibit you from calling anyone other than your mother or the police if you are drunk. If Twitter had a delay and possibly a stupidity filter or psychosis test, it could prevent one from tweeting ignorant, impulsive, racist comments. Microsoft Word has a grammar filter so if you write an improper sentence the program underlines in green the incorrect word or phrase. Twitter should be able to do this and highlight an offensive tweet in yellow. Before you press the Tweet button it could provide a popup menu to warn you: “You have text highlighted which indicates you are about to send an offensive, stupid, or worthy of firing tweet. Do you want to continue?” Of course, this will not affect those who are tweeting or commenting anonymously. John O’Connor posted some links to articles on the IOLE blog and I found this looking for a government worker who was fired over a tweet…..
Hey, I’m trying……in one year I have blogged, tweeted, and entered Second Life….. considering my dislike of social media, I am on fire. Well, maybe lukewarm. First, if you are presenting, especially with many technical terms, why would you talk so fast you can barely be understood? Isn’t a basic rule of communication to talk so your audience can understand you? Prosumer = combination of producer and consumer that describes web 2.0 but Bruns thinks this idea problematic. Consumer takes part in the production process, punches the buttons that propels the manufacturing. The customer is contributing money and marketing and design information, all of which are vital to end product. Bruns wonders if on the on demands of the customer is really driving the manufacturing process. Prosumers are seen in some industries as high end consumers, like car companies that offer custom modifications. Bruns doesn’t think this captures the collaboration that is occurring. He thinks it is more than consumers being producers. He thinks we need to look beyond idea of production and consumer. Prosumer adds to the loop of producer, distributer, and consumer. Bruns doesn’t think this idea or model reflects what is really happening between the internet user and the final products. Wikipedia is an example – the end product is ongoing. The ongoing revision is important because it relies on the contributors. Evidently, his whole presentation is to this point – the ongoing revisions of fille-in-the-blank is the key. I am not sure what it is key for, to, against, because, in spite of, etc., but it is key. People are in the community of groups that change content and the community has structure. “The process is more important than the finished product.” This idea has been echoed by our instructors and our primary project. Produsage is beyond producing but the users can produce content. There is a lot of collaboration going on, whether for Wikipedia or beer, and that creates a new value chain. The collaboration generates products that can be used in place of conventional products. There are books on the topic. Hopefully they are not written as fast as Bruns talks. In all seriousness, I think I may, possibly understand what he is trying to get to, but I am obviously not confident in my guess. It would have been helpful to have more of a background than a speedily discussed slide or two. It also would have been helpful to understand every word he said. Because of the nature of technology – because we have the ability to make changes to something on the spot, whether that something is documentation for a definition of a word or event, or documentation for plans to build a product, or documentation of a process that people need to follow online or in life, the way we used to think about production cycles has changed dramatically. These changes impact the final product as well as all of those involved in the process. New terms label the people involved and the process. The terms are not as important as the impact. How will these changes lead to better collaboration among people and better products? If production can change immediately, what are the ramifications to the end product and the production line, virtual or tangible? I think this is a fascinating subject because it immediately impacts our lives and I find production interesting. Marketing, selling, and advertising are equally interesting to me. One facet usually impacts the other dramatically. In a new model, how do they all work now and what do the changes mean to the end product, the people involved, and the future of our products? Will we all be producing our own products someday? We are supposed to blog on our group’s progress. While individuals in the group have taken on a task or two and either completed it or are in process, I do not feel like we are a group because we are not communicating well together, we are not responding to each other. Interestingly, out of the roles Sitearm Madonna originally discussed, we all picked almost the same roles or very similar in theme roles. I think we all want to succeed but are not sure what exactly to do. We have some limitations but every group has limitations. I do not have a smart phone, one member does not want to use Facebook to communicate, and one is five hours ahead in time. We all seem to have crazy busy schedules, as I’m sure other groups do also. We quickly picked a charity and created a Googledoc so we have a venue to communicate. I posted some questions and thoughts about how to proceed. I created a Doodle to try to find one time that worked for everyone to go into SL together. I was able to talk with our Dublin group member during our time in SL and that was priceless! I talked with one of the members on the phone and met with one group member face to face. I guess I am old fashioned but I prefer to talk to try to get to know people because I think it is easier to work with someone you know, even a little, than complete strangers. In keeping with our goal of getting the word out about our charity I asked every cool person I know to retweet a tweet I sent with our charity’s web site. Sadly, I do not know many cool people and I found out everyone I thought would retweet my tweet do not tweet at all. These are managers in the technology field, people you would think would use the latest and greatest technology. They all use Facebook to share photographs of children with their friends and family all over the world. Since I happened to be the only one who attended class last week the instructors asked me to try to move the group along. Thus far I do not feel like my approaches have been effective. I think I managed to offend someone which I did not intend. I tried a new approach today and hope it will get the ball rolling. Time will tell. I think this group assignment would be a good case study if compared to a class that met face to face once a week for the same time period and given the same tasks. The Medium is More Important – Is That Why They Charge So Much? The medium is more important than the message. I feel like I’m missing something because I do not agree with this. My analogy is this: my voice is not as important as what I have to say. There are times the medium is very important. Books on tape are one example that comes to mind. If you have ever listened to a book on tape by a reader who is lifeless, monotone, and not into the material, it is painful to the point that listening has to stop. But is the reader’s ability to read the words more important than the words? Can one exist without the other? Is this a fair question? People who cannot hear can still communicate – is their medium more important than the message? Technology is important and has tremendous benefits but I think if we do not put it in its place we do a disservice to our abilities and our power. If we give the medium more power than we give ourselves, is the content diminished? Will our thoughts become diminished? “If you really like it you can have the rights, it can make a million for you overnight.” Paul McCartney (and John Lennon) wrote those lyrics to Paperback Writer. Further along in his career, McCartney realized the value of owning rights to songs. He purchased rights to songs that had sentimental value to him, like the Buddy Holly catalogue. Meanwhile, his younger pop protégé, Michael Jackson, purchased the rights to the Beatles songs. Jackson had no way of knowing his $47.5 million dollar investment would pay off so well. He bought the rights because he believed in the value of owning the rights to songs and he understood the value of owning the Beatles’ songs. Those rights are now partnered with a company worth $200 million, only 31 years after he made the purchase. To be honest the research paper, Content & Licensing in Virtual Worlds, was difficult for me to follow; in part because I do not understand some of the legal lingo, and in part because the virtual world is virtually unknown to me. My speed for a video game in the day was Galaga and Centipede and I have never had in interest in role playing games. Although I understand that a virtual world is neither of these games, it does seem like the next level amplified. The authors do an incredible job of providing background of virtual life. Essentially I have gone from preventing a bug from growing larger and killing me to seeking out virtual lands occupied by real people who have the power to personify someone or something else. All the while ensuring my avatar is dressed appropriately, no easy feat considering the ratio of slutty clothes to academically appropriate attire seems like 1,000 to 1. I digress. Since I understand song rights I am trying to apply that (limited) knowledge to rights within a virtual world. My understanding is this: What is at stake is money. If you build it and they come, and they come with real money, do you legally own it and can you claim its rights? Can you change it after they have it and can you prevent them from changing it enough to claim their own rights? It almost doesn’t matter what it is and where it is at – if it happens to be in the virtual world then so be it. Of course, I could have it all wrong. Lastowka and Hunter stated, “It seems that Nike and Levi-Strauss are intrigued by a market for virtual “goods” which requires no costly physical inputs, and which is apparently a remarkable example of people being prepared to pay for nothing except the perceived value of the brand.” I understand that to be tangible means I can touch it. What they do not address and I would like to know is: if I can see it is tangible enough? I can see the swish on the Nike shirt someone may put on his/her Avatar’s clothing in SL. If I can see the swish how is it a perceived value of a brand? If I see it, it is the brand. They also state, “However, a metaphysical shift has occurred so that while today’s real property interests may be associated with a tangible thing, the estates or interests themselves are commonly understood as intangible.” If I can see an estate in SL is it not real? If I can compare a simplistic build to a complicated, detail-oriented build and determine the value of the latter based on time, materials, knowledge needed to build, and the parameters of the value of the currency, are these criteria enough to determine rights? I would like to see what the same authors would say now about End-User License Agreements (EULAs). If I understand the few segments of news stories I saw on the subject, Facebook has taken broad brush strokes with users’ privacy rights by changing EULAs without communication to users. Yet users……keep on using. Another part I do not understand. “Those who control the daily grind of Blazing Falls, for instance, have fashioned themselves as Municipal Observation and Management Incorporated (“MOMI”), a nebulous organization with no visible in-world presence. According to the End-User License Agreement of The Sims Online, it is an offense punishable by avatar death (account termination) for a citizen of Blazing Falls to impersonate an officer of MOMI.” How can you punish someone to death for impersonating a person who has no visible presence? Also, how does one impersonate someone or something they have never seen? Is MOMI the equivalent of RL Edward Snowden? Is there actually a (regular) end user that has ever read any End User License Agreement? I think I understand the reasoning behind the need to sort this out soon, since we live in a contiguous society and lawsuits have already been filed. In The Laws of the Virtual World, I think Shenlei Winkler’s resolution is to arm creators with the foundations of a legal framework to protect their property against people who will take it and call it their own. Would the decision of our unbiased Supreme Court matter in the virtual world? If Corporations can be given the same rights as people, would that benefit Sony, IBM, Nike, etc. in SL? Lastly, I have to address a monumental RL issue regarding rights. I live in a community where there are 90 wells, fracked sinced 2004, in 13 square miles. The Federal government allowed gas/oil companies to be precluded from federal water and air quality guidelines under the guise they thought each state would enact their own regulations. Ohio has no such regulations. In 2004 our State government took away local home rule – that is the right of the people, individually or as a community, to determine if they want a gas/oil well next to their house or just over the border of their backyard. Despite the insistence of the gas/oil companies that no water or land has been contaminated, evidence exists that proves otherwise and it is mounting. Lawsuits have even been won by people who have had their land and/or water contaminated or who have been damaged in some way by an unwanted gas/oil well. Sadly, the number of people who have been damaged or had their lives ruined and have not won or have no recourse is substantially more than one and growing. Our Ohio EPA does nothing. A community rights group that I helped start, Mothers Against Drilling In Our Neighborhoods (MADION), asked the Ohio EPA how many air quality tests were done before, during, and after each new well. After much pressure they would only say, off the record, they were asked by the Governor’s office to halt all investigations into why testing has never been done. The Ohio Department of Natural Resources does nothing. Ironically, their sole source of revenue is from hunting licenses and gas/oil. Every time a news reporter “digs into” the situation, the gas/oil industry saturates the market with commercials telling you how safe fracking is and that is has been done for 60 years. In my town, if one well blows up literally half or most of the city could be gone. For those that say we need gas/oil to sustain our lives. I do not disagree with the main premise but our lives are being forced into this controlled dependency. Several years ago our state eliminated its budget for wind energy exploration at the request of gas/oil. Regardless of if you agree with drilling or not – at the root of all of it is a rights issue. Ohioans have no rights whatsoever. Many people I know have been pooled into a well. The gas/oil companies are allowed to pool people – force them, against their will, to be part of a gas/oil well lease. We have no rights because money wins and rights are ultimately about money. The Community Legal Defense Fund (CLDF) was established to help people protect themselves against big business and health impacting situations. Their approach is to reclaim rights by voting for a Bill of Rights (BoR). Currently, my communities’ BoR is being challenged in court by gas/oil who plan to continue to drill in my town. You can see all types of injustices being made in RL that have real detrimental impact at www.celdf.org. Relative to the battle being lost with our real life rights, which directly affect our health and water supply, I find the issue of virtual rights somewhat insignificant. However, since I wholeheartedly understand, via music and writing, that what we create we should have a right to own, I do acknowledge that some decisions should be made regarding virtual rights. Given my exposure to big business always winning against the lowly innocent bystander though, I am not hopeful that any issue will be resolved in favor of the cyborgs, only the Gods. One of my most amusing experiences in Second Life this week was learning how to remove clothing that I could not just click and chose do not wear (no detach was available). After what seemed like 30 menus I was successful. I visited three places to dance and saw some people dirty dancing in outfits that would be unacceptable in any respected establishment in RL. 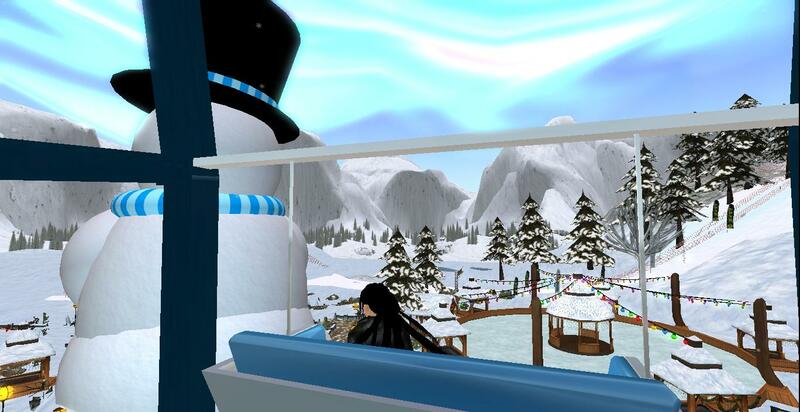 Although I do not like RL snow, I found a SL winter wonderland and took a ride on a large Ferris wheel that overlooked slopes and ice chutes. Snow is beautiful when you do not have to drive in it or feel its coldness. A giant snowman resembles the Staypuff Marshmallow Man. Many of the places I visit either will not allow visitors, at least fiscally challenged visitors, or say they are free but the free part is very restrictive and not interactive. A classmate and I went to a land touted as a painstakingly recreation of Alice in Wonderland. It also said it was free. After going down the rabbit hole we found ourselves in a small room and needed to pay real money to go farther. She touched a bottle and died which was a good cue to explore elsewhere. Most of the places I have gone to are void of people. A few places where I have found people the people were not interested in talking with me. It seems as if my avatar has newbie written on its forehead and it is akin to being a freshman in high school. A few group members and I went to the Free Dove and scored some free stuff. I found out the hard way that what you get is not always as its described, just like RL. Finding time to meet has been challenging. I did find a place that sounds cool. A DIT student and I went to Rocca Sorrentina which has public and private areas. Designed by Brown University it is meant to recreate Italy to discover more about the Enlightenment Era. It looked cool and the map showed people but we could not actually find them so I think they were in the private part. It would be optimal if there were audio tours that explained what they built and why, or something that had more explanations. Perhaps they exist and we missed it? I like the premise of this and will revisit if time permits. I have reached out to the educational groups I joined to figure out how to actually communicate within the groups. Hopefully, as time goes on these groups will prove beneficial. So far my favorite place has been Mirromere, suggested in a blog by another student. I love Cuyahoga Valley National Park and Mirromere has similar trails. Horses had great neighs and I found an open cabin with a fireplace, a blanket in the middle of a field, a bench on a bluff, and horseback riders. Unfortunately, the few people that were there did not seem to want to communicate with me either. It is enough to start a complex. Some items mentioned in the blog, The Lazy Person’s Guide to Branding, are difficult for me to wrap my head around. I am trying to accept that social media is here to stay and that it’s not all bad. This blog asks questions to help you create a brand to find a job. I understand branding from a company standpoint and to some degree it makes sense to me. I also understand it can help someone across their career and possibly help present oneself in a favorable light to find a job. My caution is that branding, like any concept that is designed to assimilate you into one way of doing something, can also stifle you and minimize your creativity. The first suggestion is to think about what you gravitate toward. I gravitate toward the road less traveled and have no social media presence. The blog indicates this can hurt my chances of getting a job. I like to look at this differently. My way, Human Resource personnel will have nothing to sift through to determine if I am inappropriate; they may find this refreshing. It is suggested that you ask questions to those closest to you to determine what you value. If you do not know yourself well enough to know what you value, perhaps a brand is not your biggest problem. 2) Analyze your idols. This could be the core of some of my issues with social media. Before social media I thought we, as a society, idolized the wrong people. I want to idolize people who make a difference, not someone who makes a lot of money because they can throw a football or sing. I love music and I think it can make a difference but there is a distinction between liking someone’s music and idolizing them as a person. Wanting to look at their half-clothed body or whatever they happen to be doing today is not on my radar. Social media has added a shallowness to our idolizing by perpetuating our taste and curiosity for things that don’t matter at an alarmingly rapid rate. Intangible values like caring, thankfulness, and a great work ethic should not need to be pinned, tweeted, or blogged about. I do not see the value of having masses idolize someone because their tone, aura, and color scheme are consistent. 3) Find you niche. Is this irony? Be like everyone else but find your niche. Creativity is one of our most precious gifts and I encourage you to not let it be shoved into a template. I am going for the niche of the unbrand; if getting a job relies on my brand I am in serious trouble! 4) Label your expertise. This scares me because it seems we are taking a human element out of finding the right person for the right job. Pick the right two words and you may get an interview. Again, it is our instant gratification at work. Ten years ago the resume was the most important way to get a job and how it looked mattered. We have managed to dwindled it down to two words to determine if your resume will be grazed upon. I would not suggest using “unconformity rules” as your two words. 5) Get your opinion out there equates to use social media often. Of course, using social media to share your opinion may prove to those researching you that you have nothing of value to say but post for the sake of posting. I understand some sharing is good and lives may be changed by insightful thoughts and informative writing. But just like books, there is a lot of crap being written in our cyber world. The suggestions continue along this vein. I am looking at branding as conformity at its deepest and find it scary. It’s the epitome of society’s unwritten code. If you, or in this case your brand, is good then you are accepted, if not, so sorry, back of the line. I do understand that getting an interview is paramount. The blog omitted the most important aspect of landing a job which is what you say when you sit in front of those that interview you. All the people in the world can “like” you but if you cannot convey your abilities, skills, knowledge, and/or humanity to another person, you may not be hired. Be sure to put as much time and effort into what you will say in an interview process as you put into your brand.